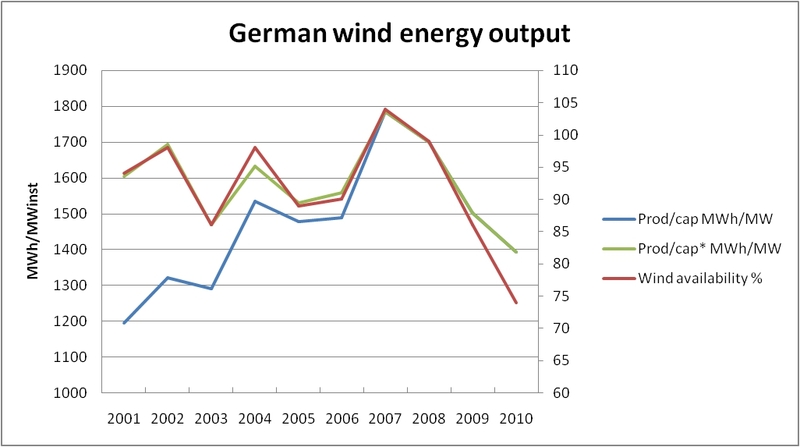 Here are some brief considerations about the performance of German wind energy facilities. Over the past two decades the number of wind turbines installed in Germany has increased dramatically. The surge in capacity amounted to 350 % between 2000 and 2010. The growing capacity lead in turn to a growing production of electricity, 300 % up over the same period. One question of particular interest to us was how much energy one might expect to be generated per MW installed on average. As the production of this kind of energy is highly sensitive to the availability of wind we were seeking for a model which is able to reflect the variations of the latter. The source data for our investigation were taken from both Eurostat and Bundesverband WindEnergie, the German association of wind energy producers. 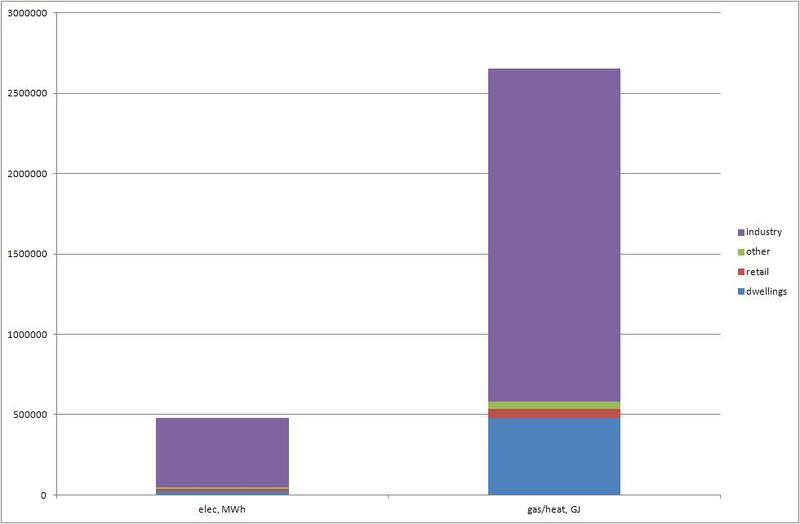 We started by looking at the amount of energy produced per installed capacity (Prod/cap) measured in MWh/MW between 2001 and 2010. We may call this quantity the specific production. The result is the blue curve in the figure below showing a clearly increasing trend. It must be noted here that this graph needs to be interpreted with special care, since it is distorted by two major sources of uncertainty. The first source is the varying wind availability. The second source of uncertainty is based on the fact that the number of wind mills is constantly growing over the year as more and more turbines are constructed. The total installed capacity may go up by some 30 % and more during the course of a year. Some of the newly built turbines may take up operation in spring and others may be commissioned towards the end of the year. In each case their contribution to the entire production will be very different. Thus our model has to account for the extra capacity erected during one particular year. Another factor coming into play is the location of the turbines. Although each of them is supposedly optimized in terms of output, there may be significant differences between various wind farms. However, as more and more turbines come into existence, the influence of individual outliers should diminish compared to the total average. We always have the big picture in mind, thus neglecting the performance of particular locations. In theory, the specific production should exactly correspond to the amount of wind available. The latter quantitiy is represented by the red curve as a percentage over the long-term average (r.h.s. scale). As can be seen, the variations may be tremendous. Production of wind energy in MWh/MW(installed) and comparision with wind availability. We note that the red and the blue curve do not coincide as expected. This lack of coincidence is mainly caused by the addition of extra capacity which, in relative terms, was very large during the first part of the period in question (44 % and 37 % in 2001 and 2002, respectively, compared to the previous year). In order to find a better agreement between the wind availablity curve and the specific production we developed a statistical model which enabled us to eliminate the distortions caused by the newly built wind mills. The result of our model calculations is shown in the green curve which nicely matches with the availability curve (red). What we got is a new quantity Prod/cap* which allows us to draw meaningful conclusions about the mean productivity of each MW of installed capacity. Depending on the availability of wind Prod/cap* may vary considerably. At a value of 100 % availability each MW installed should produce slightly more than 1700 MWh annually. 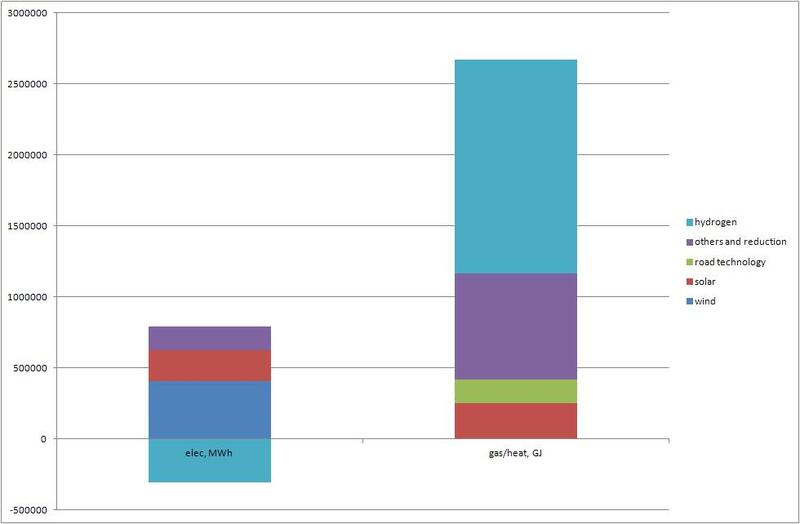 During our reference period Prod/cap* varied between a maximum of 1800 MWh and a minimum of 1250 MWh. This is a massive variation which must be taken into account when considering the energy supply stemming from wind farms. Below is a report about the SHEAB project which is designated to harvesting solar PV in central Sweden. In two small municipalities, Sala and Heby, located north of Västerås and West of Uppsala, is the home for Swedens first and only (?) multiple-owned economic association investing in Solar PV. It all started in 2008, when the municipality-owned energy company Sala-Heby Energi AB (SHE) wanted, as the first energy supplier in Sweden, to offer its customers to trade with electricity from the sun. A number of options were presented to SHE´s customers in the autumn of 2008 and a specific offer was made. Solel i Sala och Heby Ekonomisk förening was then formed in the spring of 2009 as a result of this work. The first co-owned photovoltaic facility was built in Sala in September 2009 and since then, a new PV plant has been built every year. During this short period of time the specific investment cost of turnkey solar PV plants has fallen by more than 70 %! Today the co-owned economic association has nearly 200 members, mostly private persons but also a handful of companies. The total installed PV capacity is 200 kWp, giving approximately 180 000 kWh annually. These figures are growing though, since more members are joining and some old members buy more shares. During the first five years, the association has decided to use all its incomes and membership fees to build up a palette of Solar PV plants. Thereafter, the electricity production from the PV plants will give members cheap electricity for a long time, combined with continued commissioning of new solar PV plants. The formation of Solel i Sala and Heby ekonomisk förening shows that it is possible to take advantage of a local interest, from both private persons and companies, in solar electricity and turn it into construction of large photovoltaic systems. It also shows that it can be done in a relatively short time. A sustainable city needs to be SMART. In order to reach sustainability, SPECIFIC targets need to be set and met: e.g. reaching climate neutrality within a certain time frame. Those targets need to be MEASURABLE. It is not enough to just talk about sustainability and a transition. It is very important that the targets can be quantified and that results are shown. Reaching sustainability demands a lot of effort. Therefore it is important to make a time-plan and split up the final target into small steps that can be reached more easily and which can be measured. This introduces the 3rd aspect, i.e. targets need to be ATTAINABLE. When dividing the final target into smaller steps, results of the measures taken become visible one by one. It is also important to involve local stakeholders, e.g. inhabitants, local companies, governments, etc. Each step in the plan towards final sustainability can be celebrated, giving a boost to the people involved, showing that their actions result in something positive on the way to the final target. The measures need to be REALISTIC. It is good to dream about sustainability and about the transition to a sustainable city, but it will be reached by taking one step at the time. When going too quickly, without a plan to follow, problems can be created and it may become difficult to reach the final target. The approach needs to be TIMELY. It is important to develop a good plan towards a sustainable city. This means going step by step, and choosing which step/measure to take at which moment in a smart and innovative way. Thus, use what is available at a certain time and apply this measure to the best knowledge. Furthermore, try to find ways to improve these measures to bring cities to a next, sustainable level. There are many examples and I will name a few. On the island of Samsoe in Denmark, they reached energy neutrality in 2005 (started in 1997). Some general facts: surface is about 110 km², and about 4000 inhabitants. The energy system of the island is based on wind and solar energy for electricity, biomass (straw and wood chips) and solar energy for heat and measures are taken for the fossil fuel use of the ferries and cars on the island. Güssing, Austria, is a nice example of how a complete village and region can transition from a fossil fuel based system with high costs to a system based on renewables, keeping more of the money in the region. General facts: surface is about 50 km², and about 3700 inhabitants (region 27000). They started in 1992 with the transition. Güssing has reached a 71% self-sufficiency in 2010 (100% if industry is not taken into account) and they are working on also reaching energy autarky within the Güssing-region. The energy system is based on local available biomass (wood, grass, rapeseed), via a CHP-plant and district heating, and solar energy. I will name one other example: the work that is done in the city of Wageningen in The Netherlands to transition to a climate neutral city by 2030. Wageningen has about 36000 inhabitants on about 32 km². In this initiative the municipality involves also local stakeholders like inhabitants and companies. The targets are: 25% local renewable production, 50% energy saving, and 25% import of renewable energy. Many more examples can be mentioned. A sustainable city needs to be SUSTAINABLE. When taking a measure, this has to be done in a considered, clever way. A measure has to be ecological, economical and socio-cultural. This means keeping in mind also the future perspective: think about here and there, current and future generations (UN-Brundtland commission 1987, definition Sustainable Development). A sustainable city needs to be MULTI-functional/disciplinary. It is important to use the mixture of functions to find the most efficient and effective solutions for problems in the city. The multi-functionality needs to be seen as an opportunity and not as a problem. Another important aspect is AFFLUENCE. This means that people need to be able to live good and in the way they want, but they have to be aware of the consequences of their actions. A sustainable city has to inform its inhabitants about smarter ways to reach their targets, better for both the environment and the city. Those measures have to improve the quality of life in the city. A sustainable city needs to be RENEWABLE. This is/seems logic, meaning that the use of resources should be renewable. The measures taken need to be renewable or from residual origin. It is important to divert away from the old way of thinking: it is not possible anymore to use fossil fuels/resources as we currently do and think that we can compensate for the emissions and other negative effects. A last aspect for a sustainable city is the TECHNOLOGICAL one. This implies using the available knowledge and not always throw it away immediately because it seems not worthwhile or too expensive. Those new methodologies/measures need to be given time to develop. The technologies for fossil fuel use did not come out of the blue either and needed a lot of support as well. The following figures show results of a study applied to a municipality in the south of The Netherlands, Kerkrade. Fig. 2: Energy supply potential for the studied district (solar: PV/solar boilers; hydrogen production demands electricity which is supplied by extra wind turbines). The results are based on research described by the author in a published paper. Available by author on request. Reports on Samsoe, Güssing or Wageningen on which results are based, on request by author.